Making an instant booking for a confirmed appointment with the doctor who matches your exact requirements is now a reality for the first time in the UAE. Whether visiting okadoc.com or downloading the Okadoc app for iPhone or Android, people in need of medical care can quickly, simply and seamlessly discover the doctor they need, and make a confirmed appointment, at the time and location they prefer, on a fully automated platform and without any human intervention. Okadoc’s service comes at absolutely no cost to patients. What’s more, patients have all the practical information they need easily accessible at their fingertips, in one screen, to help them instantly make the right choice for them, based on their insurance policy and preferred language, and the doctor’s relevant specialty, qualifications, experience or gender. For price-conscious patients, Okadoc is also very helpful as it provides updated information about the cost of consultation and accepted payment methods. Practitioners from over 130 specialities can be discovered on the platform, including general practitioners, dentists, paediatricians, gynaecologists, dermatologists, etc. For those of us leading a busy life, Okadoc’s superior functionality can reschedule an appointment in ten seconds or cancel it in five seconds. Okadoc also guarantees that we will never forget a doctor’s appointment again, thanks to its non-intrusive, reminders system. And if earlier availability is required, Okadoc’s always-on system detects cancelations and offers the choice to book the preferred doctor earlier than the initial appointment, on a first-come, first-served basis. In addition, thanks to Okadoc’s real-time, 24/7 online availability, patients will never fail to connect with their doctor due to missed or off-hours calls, or because it’s the weekend or a public holiday. 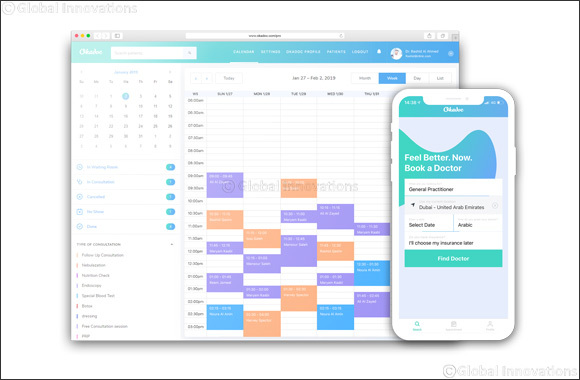 Unlike other tools available in the market which purely supply booking requests and not confirmed appointments, Okadoc is the only online confirmed appointment booking solution in the Middle East that offers a superior functionality seamlessly catering to every step of the patients’ discovery and appointment journey. Previous Story : How safe is your heart this Valentine's day?